Perfect way to reminisce about past trips and plan future adventures! Great gift for the travel enthusiast, recent college grads starting their globetrotting, and everyone in between. Map comes rolled in a beautiful vintage postcard style mailing tube. Comes with scratch tool and eraser. 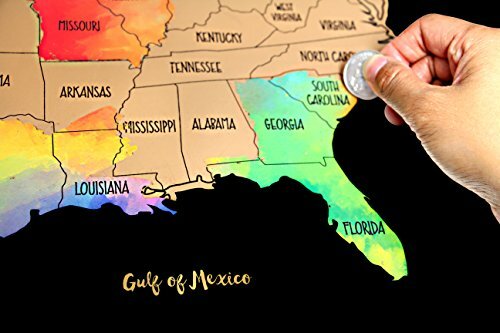 The 16" x 20" map is the perfect size for any wall and fits standards frames available on Amazon and local stores. USA STATES OUTLINED: US states are outlined for you to track your adventures in the US. PERFECT GIFT for any travel, wanderlust enthusiast! Share special travel memories with your loved ones.